Don't you love it when the New Year brings new treats? We'll its not quite 2011, but you already have the chance to grab a bargain for the New Year which you can use straight away to show your loved ones you care. 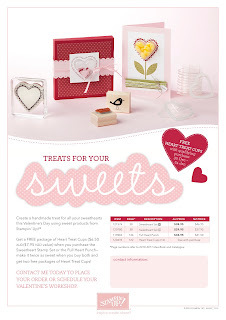 From 30 Dec - 24 Jan if you order either the Sweetheart Stamp Set or Full Heart Punch you'll get a FREE package of Heart Treat Cups -- a $6.50 value. If you order both you'll get 2 free packages - WOOT! What a great way to start the new year. Check out the details below or click on the flyer to download a copy.